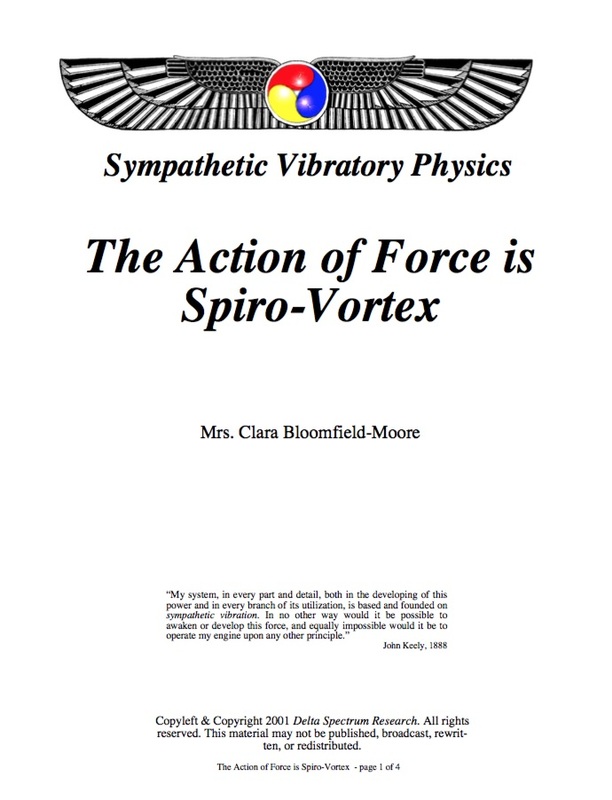 "Keely's latest discovery - that of the spiro-vortex action of currents of force - is so overwhelming in its simplicity of demonstration that it needs but to be witnessed to convince physicists that vibratory physics will place science on a height never before attained. This discovery solves problems with regard to the peculiar movements of the heavenly bodies which astronomical experts have never been able to explain satisfactorily. It also accounts for the explosions which, for years, impeded Keely's progress during his disintegrating experiments, breaking iron and steel tubes like pipe-stems, fracturing his ribs, and at one time paralyzing him for weeks." Keely discovered that all forces manifest as a vortex motion. This paper gives some background on that discovery and what Keely said about it. 8.5" X 11"